Your iPhone or any other Apple device might get used by someone else as well, not for some hateful intentions but for some important work. But upon receiving your device, if you find that person's Apple ID still stuck on your device then don't worry. These steps will give you some useful insight regarding how to remove device from Apple ID. But first, we'll be discussing the iPhone. Since iPhones are probably the most widely used devices by the techno giant, therefore, more users are prone to this problem on iPhones. These are the steps to remove the device from apple ID on iPhone. Removing a lock might be a tricky thing for beginners and even for those who have been long term users but have never unlocked their device after setting a single locking mechanism. If you’re stuck in a situation where unlocking your device has become a thing which bothers you every now and then, it would be a wise decision to go to an expert with your problem and in time, it’ll be solved. Meet iMyFone LockWiper , now this simple yet effective application does multiple things for your Apple device. If you're having a problem regarding the removal of your Apple ID, then call it in. You can count on this application as it provides different avenues upon which you can work to sort your problems out with ease. You can change to a different Apple ID or create a new one as well. Your device will not be tracked by any other Apple ID once your ID has been removed. 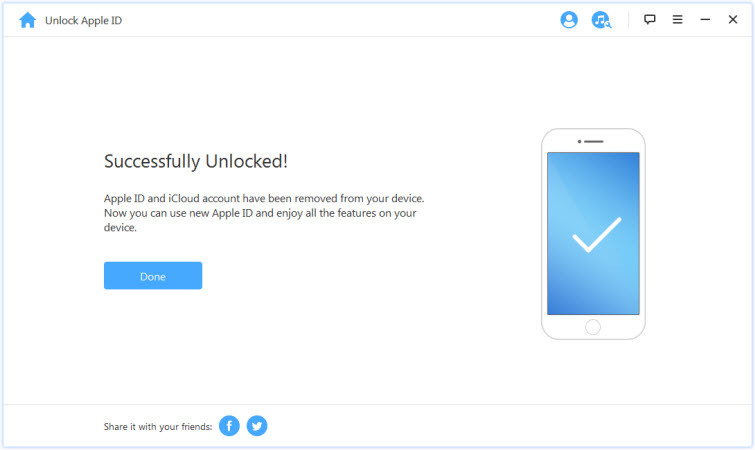 Even your device will be free from your previous iCloud account. You can still use iCloud and enjoy all Apple ID features. Step 1. Launch the application and select Unlock Apple ID mode. Step 2. Click on Start to Unlock option in order to unlock the ID from every other device. Step 3. If Find My iPhone option has been disabled then the application will automatically start to unlock the ID. Note: In case Find My iPhone is still enabled then you'll have to reset everything from the setting and to do that you have to follow Settings > General > Reset All Settings. Confirm to Reset all settings. Step 4. And the rest will be taken care of. Note: please make sure that you can access to your device before you use the program. If you have a set of Apple devices connected to the Apple ID then you can easily remove them all by using nothing but your handy iPhone. Yes, it is true indeed, you can remove other devices from the Apple ID by just following some simple steps. And that, in turn, will grant you freedom from a headache which you have been dealing with since the moment multiple devices flooded through and established their crib into your interface, hindering your liberties. Step 1: Tap Settings > *Name*> iTunes & App Store. Step 2: Tap your Apple ID. Step 3: Tap View Apple ID, you’ll be asked to enter your password. 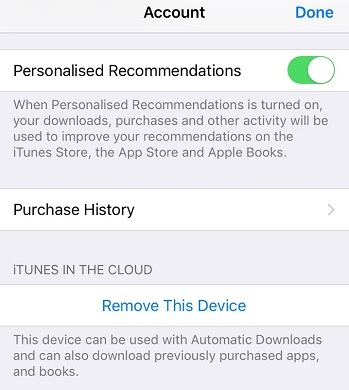 Step 4: Scroll down to the iTunes in the Cloud section, then tap Remove This Device. See, it's just that simple to remove device from Apple ID. Now staying connected with a single Apple ID might be good until all these devices are yours. Such connectivity offers a better way to synchronize the data and manage all other resources easily without doing much in every device. In fact, you can manage it all from one device and the changes will be inculcated to every other device at the same time. If a situation arises where you need to disconnect all other devices from your Apple ID for the greater good then you’ll have to go through these steps in order to get rid of such a problem. Step 1: Sign into your Apple ID account page. Step 2: Click on Devices. Step 3: Click on the connected device to get its details such as name and number. Step 4: Click on Remove while you’re on the information page. Step 5: On the final pop up click on Remove to confirm. A major thing which should be kept in mind is that even if you might have removed your device in the first place, it still might be connected again the moment you go online. If you are still signed in on your Apple ID then you might see your device is connected.